Quincy Farm is run by Luke Deikis and Cara Fraver, and Tucker the dog. Click here or scroll down to read about the rest of our team. Luke grew up in southeast Michigan, near Ann Arbor, while Cara grew up in central Pennsylvania, just north of the Maryland border. We were both raised in agricultural communities, though not in farming families. We met in New York City in 2003. For 5 years we lived together in Brooklyn, enjoying our small apartment and huge (for NYC) garden. At the time, we loved living in Brooklyn. Luke worked as an electrician in the television industry, lighting TV shows, commercials, and promos. 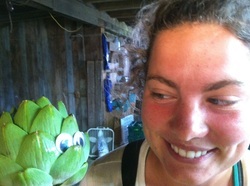 Cara worked for many years at Just Food, the non-profit that coordinates CSA's in New York City. She set up Just Food's Fresh Food For All program, which links farmers with food pantries and soup kitchens to make fresh, nutritious, locally grown food available to families in need. Prior to that, she organized a new CSA in Ravenswood, Queens, which evolved to become the thriving Hellgate CSA. In 2007, we started trying to leave the city. We spent all our free time looking for land and teaching ourselves the difference between a big garden and a small farm, hoping to start out on our own and learn by doing. Luckily, sky-high real estate prices and what little good sense we had dissuaded us. In the spring of 2008, we moved to Columbia County to apprentice with Jean-Paul Courtens and Jody Bolluyt at Roxbury Farm. Roxbury was the first farm to deliver CSA vegetables to NYC back in 1991, and their 300+ acre farm now provides biodynamic veggies and meat to 1,200 families in New York. 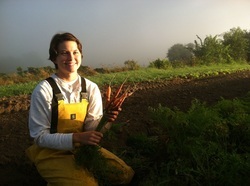 We spent the 2009 growing season working for Benjamin Shute at Hearty Roots Farm. Hearty Roots is a model success story in the Hudson Valley, expanding in 5 years from only 30 members to now feed 500 families and provide a weekly 900lb soup kitchen delivery. In 2010, we were back at Roxbury, still tirelessly searching for land to start on our own. Cara at Roxbury Farm, 2008. We were unwilling to start out somewhere without long-term tenure, but unable to purchase land where we want to farm. Our search had long ago moved from purchasing to include ground-leases and lease-to-own opportunities. We connected with preservation groups and land conservancies and spent every free day visiting properties and talking with landowners, hoping to find that one needle in a haystack that would allow us to finally put down our own roots. We saw dozens and dozens of properties, and though there were several attractive opportunities, there was nothing that was Just Right. The Wright family farm, now Quincy Farm. In June of 2010, we were visiting a friend who farms in Washington County and figured we'd visit some properties that were for sale. We'd generally given up the idea of purchasing land, but we were willing to try anything. As we pulled up to the Wright farm, we realized we might have found our glass slipper... If we could only afford it. We began researching the property and contacting every organization we thought might possibly, maybe, be interested in our cause. We were hoping to convince someone else to buy the farm and lease it to us, but we were open to anything. Fortunately, we found help in the form of two fantastic non-profits, the Open Space Institute and the Agricultural Stewardship Association. Working together, we were able to create a conservation easement on the land that will ensure it retains its agricultural value forever. This easement also lowered the purchase price of the land enough that, with a big stretch, we were able to purchase the Wright's property and continue its legacy as a successful family farm. We can't say thank you enough to OSI and ASA. Without them, this wouldn't be possible. We finally closed on the property in April of 2011, and sold at three fantastic local farmers' markets that season. Despite record spring flooding followed by Hurricane Irene in the fall, we had a good year, and even managed to get married on the farm after nine years of waiting! Luke serves on the Board of the Saratoga Farmers' Market Association, and the farm is an active supporter of several local non-profits and conservation organization. It's not always easy, but bit by bit we're building a stronger and healthier farm, community, and life. Allison Rutledge (aka, "Allison the Cat") comes to Team Quincy from the eastern shore of Virginia, after stints in the Civilian Conservation Corp, digging clams, working on another veggie farm, college, and more. When she's not doing everything else, Alli's in charge of pea and shoot production for the farm. Hannah "Puddin" Harms, from Fairfax County, Virginia, is having her first northern experience here at Quincy Farm. She's also seen her first groundhog, first demo derby, first tractor pull, first 19 degree morning, and more. 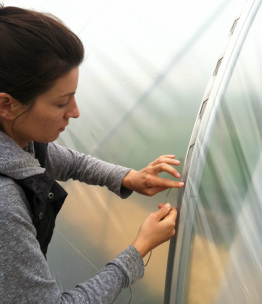 When she's not doing everything else, Hannah does all the greenhouse seeding and transplant production for the farm. Becky Keim ("Bucky") came to us by way of Los Angeles, where she'd been practicing law. She plans to start a veggie farm of her own and we wish her the best. Most of this webpage remains un-touched from the years when Cara and Luke ran the farm... but we felt we owed some epilogue to the many, many people who supported us along the way. In a nutshell, in the winter of 2013/14 Cara and I sat down and evaluated the farm and our lives and how things were going generally--a smart thing for everyone to do now and again. Despite some rough years, weather-wise, our little farm was thriving. Our CSA members and market customers were happy, our crew was happy, our soil was rebounding, with rising organic matter and biodiversity, and, not least of all, our finances were well in the black. We were making ends meet, making capital investments to grow and better the business, and saving a little for tomorrow. With the support of a smart and hard-working crew, we were no longer putting in completely insane hours in the 2013 season, and the upcoming year was looking to be better yet... Despite it all, we were both feeling so burnt-up and stressed-out that the overwhelming emotions, for both of us, were negative ones. At first, we didn't really allow ourselves to even discuss the possibility of quitting--when you've worked so, so hard to achieve a dream--and succeeded--even to consider walking away feels like treason. But each of us was feeling that this just wasn't working on a personal level. We gave ourselves the weeks between Thanksgiving and New Years to sort it out (not that we weren't still harvesting, washing, and going to 3 weekly markets, but it's at least a LITTLE slower). We read a lot, online and elsewhere, about making holistic life plans, sort of visions of how you want to live your life, and what you want the character of that life to be. We each wrote up one of these things, articulating the relationships we wanted to have with ourselves, our work, each other, our family, our community. It was a bit hokey, but it was also really helpful. There was no clear answer... but it started to become clear that, while we didn't know exactly what we SHOULD be doing, running our own vegetable farm was NOT the right fit for us. A big part of the problem, for me (Luke) at least, was in my inability to disconnect from the stresses and concerns of the business. Even on the very best farm, there is always SOME triage, some failure, some broken machinery or missed cultivation or bummer crop. Always. With a strong crew tackling the to-do list, we were able to take off our boots and come inside at a reasonable dinner time... but the pressure of all those little things continued to weigh on my mind. It's silly; it's unreasonable... but despite a laundry list of successes and jobs-well-done, those few daily failures kept me from feeling like I was doing a good job even though our crew, customers, and bank account said otherwise. Failing is something I do not handle well, and that feeling, day-in-and-day-out, was killing me. It didn't matter that I knew it was in my head. Like an undertow beneath my daily happinesses, life felt like a stressful failure. Cara is much better than I am at really disconnecting, but I think she also had less of a manic drive propelling her to farm, and therefore less satisfaction with the whole thing even without my psychological boat anchor weighing her down. Regardless, being in a business relationship--not to mention a marriage--with someone who's so deeply struggling with the enterprise is no picnic. So we decided to quit. In January 2014, we announced the news first to our CSA members, and then to the farmers' market Boards and our customers. We sent out a big list of equipment and supplies for sale and quickly liquidated what had taken years of careful craigslist'ing and auction-scouring to collect. With full tunnels of winter greens, pea-shoot production in full swing, and thousands of pounds of sweet potatoes, beets, carrots, and other storage crops in the barn, we continued to attend markets through April of that year. In June 2014, we listed the property for sale to a select few individuals who had heard through the grapevine that we were moving on, and later that summer we closed the sale. As a beautiful bookend to our tenure of this wonderful piece of ground, we were able to sell our farm to a young organization called Dirt Capital Partners, based in the lower Hudson valley. This great organization helps new farmers afford access to quality farmland, and they've partnered with Kim and Ejay of R'Eisen Shine Farm to help them move their growing pastured animal operation to Easton. We knew both Dirt Capital and the R'Eisen Shine folks loosely before the sale, and we think highly of both of them. With the protection of ASA's conservation easement and the stewardship of Dirt Partners, we really feel this land is in good hands. Having closed on the farm sale, we've moved down into the lower Hudson Valley, near Peekskill, NY. This is about an hour from NYC, which allows Luke to once again work as a lighting technician in the world of television, while still making us reasonably close to the woods, water, and nature we love. It's a little less satisfying than growing veggies, but the feeling of coming home from work is heavenly. While our tiny town lot and modest home are a huge step smaller than our old farmhouse, we actually have tremendously better access to woods and hiking, not to mention the time to enjoy those luxuries. We're excited to be welcoming our first child in the summer of 2015, and to get a little closer to being the people we'd like to be. We wouldn't trade a thing for the people and experiences we knew farming. We feel like we got into it for the right reasons, did a good job, and made the right, if hard, decision in choosing to quit. If we can continue to be as honest and true to ourselves with the rest of our lives, I think we'll do just fine.